MFG Tray ventilation trays feature dropped sides and/or ends to maximize air flow and encourage fast, thorough parts drying and cooling. A variety of depths are available to accommodate a wide range of part sizes. Composite construction ensures that these trays may be readily stacked without sagging or bending. Interior corners are rounded to facilitate cleaning and prevent the accumulation of residue. 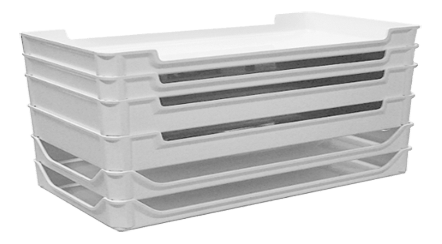 Ventilation trays may be used in temperatures ranging from -60° to 250° F (-51° to 121° C) making them compatible for an array of industrial and processing applications.